With the MVP 2.0, Innokin follows up on a well regarded design by sticking with the proven formula and adding a few enhancements. 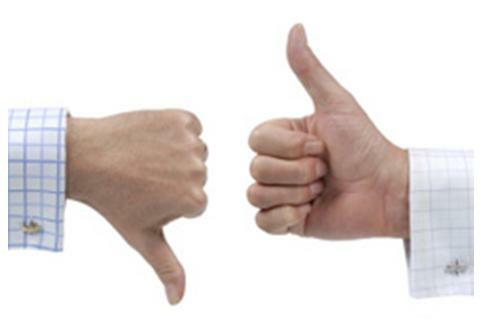 The result is an even more competent device that gives up none of its predecessors winning traits. The MVP line is impressive in it styling and build quality. The device feel solid and looks good. At 5.4oz, it is not too heavy, but has a good solid feeling to it. Chrome top and bottom plates cap off a great looking brushed metal body. The LED screen adds even more chrome to the appearance, with a blue LED appearing when in use. The bottom of the device maintains the design of the original with one of the MVP’s defining characteristics, dual USB ports and an on’off switch. 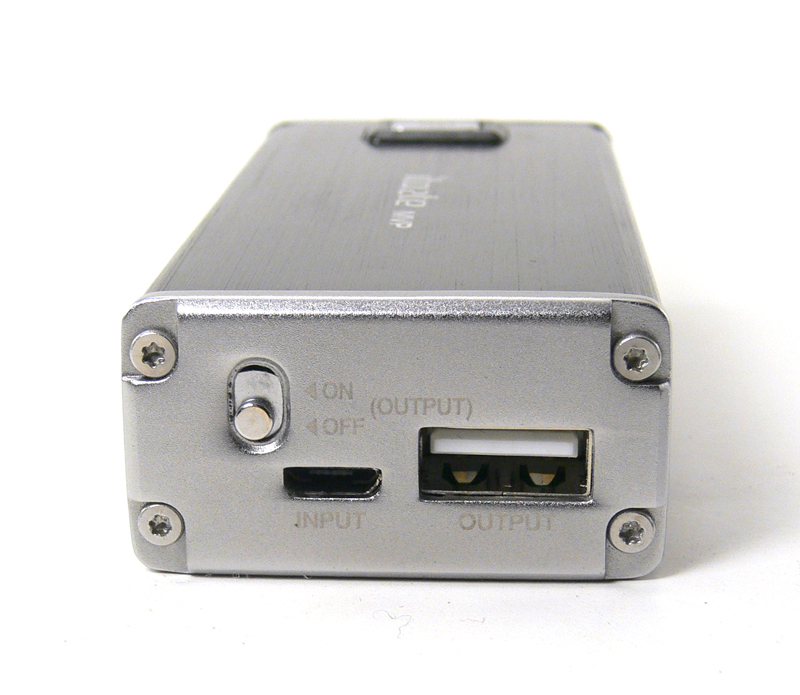 The mini USB port is used to charge the device, while the full size port is used to charge external devices like a cell phone of MP3 player. A small on/off switch activates this mode. 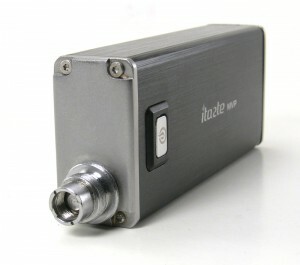 The device can even be vaped while charging or while supplying power to another device. 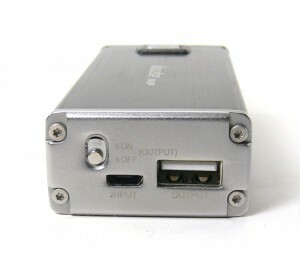 A nifty power cord incorporates mini and micro USB as well as an iPhone plug for charging other devices. The cord is also used to charge the MVP’s internal non-removable battery. 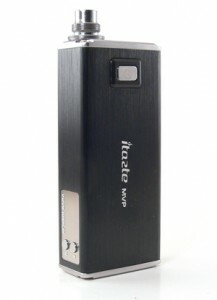 Power is delivered to the atomizer via a solid eGo style connector which is solidly attached to the top of the MVP 2.0. 510 inner threads and eGo threads around the outside mean that the device can be used with a wide variety of atomizers, cartomizers and clearomizers without an adapter. A beauty ring is included to cover the eGo threads when a 510 topper is used. 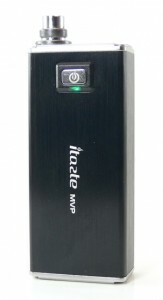 As with the earlier version, the MVP 2.0 has three buttons that are used to access all of the functions. A large button higher up on the larger side is used to turn the device on and off (three quick presses) and to fire the atomizer connection. The button itself is an improvement over earlier models with an easier press and better tactile feel. It’s a nice improvement, especially since I’m still not wild about the ergonomics when pressing that button. It just seems to be in a slightly awkward position for a thumb press. A ring around the button blinks red yellow and green when the device is turned on. The ring then displays one of those colors to indicate the remaining battery life; green for good, yellow for not so good and red for charge me now! Two smaller buttons are located on at the bottom edge of the small side next to the LED display. These buttons are a little small for larger fingers and it is sometimes difficult to get them right without blocking the screen. Buttons are labeled “P” for power and “U” for voltage. I understand why it is easier to display a “U” than a “V” on an LED display, but I can’t see that as a good reason to label the button with a “U” as well. Version 2 of the MVP adds the variable wattage (power) capability, which automatically adjusts the voltage to the correct output for the resistance of whatever atomizer is attached. Pressing the “P” button for 3 seconds allows you to enter variable wattage or “power” mode and subsequent presses increase the power in .5 watt increments. The same sequence of presses on the “U” button are used to adjust the voltage in .1 volt increments. Adjustable power capability depends, of course, on the device being able to detect resistance. This leads to the addition of an ohm meter, perhaps the most requested feature on the original MVP. Pressing both “U” and “P” buttons simultaneously causes the display to show the resistance reading, battery charge and the number of puffs since it was last turned on. 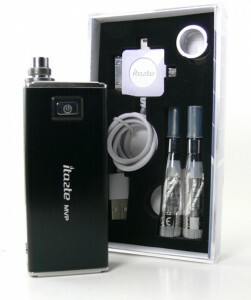 The MVP provides excellent power for a wide variety of atomizers and cartomizers. There is a limitation to that power at 3.5 amps, putting the MVP somewhere in between an eGo Twist at 3 amps and a ZMAX or VAMO at 4 and 5 respectively. In practice, that 3.5 amps is plenty to make for a nice warm vape, but not enough to cause real melting wire trouble. The stated range on the device is 3.3-5.0 volts or 6-11.0 watts, and the measured output is consistently on target to what it’s set for. The eGo threaded connector is great for use with eGo threaded clearomizers like the included iClear 16s htat came with our kit or the popular EVOD. The MVP 2.0 can also be bought with a larger capacity iClear 30, but I am not quite as fond of the appearance with a larger tank. Used with a smaller clearomizer, the MVP is a wonderfully pocketable device. Here is where we have to give a nod to one of the biggest features of the MVP, value. At less than $60, it provides everything needed to get started in vaping, including a device that is popular among experienced users as well. The only drawback to that value is the fact that the battery is not meant to be user replaceable. When the battery starts to fail, which all batteries eventually do, the MVP will be essentially scrap. I have no reason to suspect sub-par longevity from the battery, though, so one could easily expect to get over a year or two of use out if it, which isn’t bad for the price. It just strikes me as somewhat of a shame, because with the build quality, the device itself is certain to last a lot longer. The MVP remains high on my list of recommended devices, however. For a budget minded user who doesn’t mind a box instead of a tube, it’s almost a no-brainer. Madvapes and Smoktek are two of our favorite suppliers that have the MVP kits at attractive prices.